All the lumber, nails, and supplies needed for volunteers to build homes. Campus chapters raise funds to support the work of local Habitat affiliates, contributing both to their local affiliates and to Habitat for Humanity’s global mission. Chapters may contribute through house sponsorship, the tithe program (donations to a Habitat for Humanity affiliate outside of the United States), general donation to Habitat for Humanity International and Collegiate Challenge Global Village. Shaping the policies and policymakers who can help make the dream of homeownership a reality. Act! Speak! Build! Week, World Habitat Day, and other campaigns through Habitat International’s Government Relations and Advocacy department are all available to help chapters advocate for affordable housing. The best messengers come from peers. Campus chapters educate others on their campuses and in their local communities about the mission and work of Habitat for Humanity. 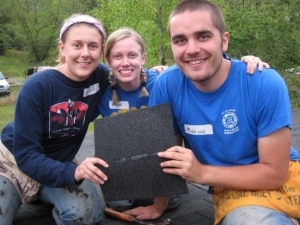 Many chapters offer speakers, do tabling and create other opportunities to inform their fellow students and members of their communities about the mission of Habitat. Near home, across the United States, or around the globe. Collegiate Challenge offers an education all its own. Whether your group is on the build site or serving in the ReStore, you’ll be learning about substandard living conditions and how affordable housing builds strength, stability and self-reliance for homeowners. This will allow you to see not just a house being built or repaired, but the people behind it – macro issues on a micro scale. These are life lessons you’ll carry with you far into the future.